A fundamental aspect of Storypark is that parents have control of their child’s online portfolio. Parents have free access to their child’s Storypark for as long as they want. That means that parents can continue to access and add content, even after their child has your learning service and been removed from your Children page. Should they choose to, they also have the option to cancel their child’s account at any time. In doing this, all content is removed from Storypark permanently. When a child leaves your learning service, you can remove them to make room for another child space on your plan. The child will now appear on your Removed children page and their stories can be exported for your records at any time. When a parent chooses to delete their child's profile (either a child that still attends or has left your service), the child will be completely deleted and you will not have access to their profile or stories any more. The child will also disappear from any plans that they've been added to. What happens when a parent deletes a child? 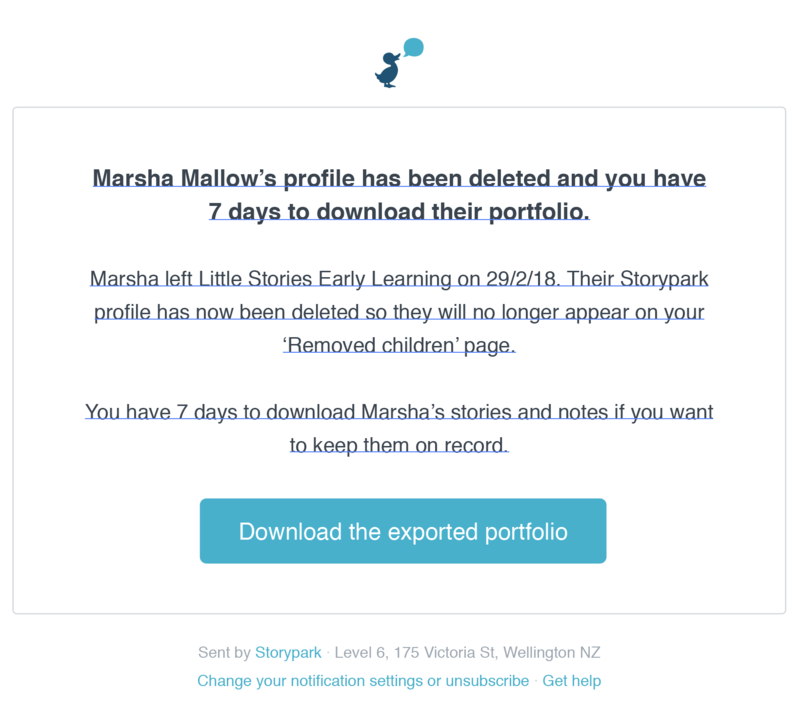 When a parent deletes their child, admins at your service will receive an email to let them know they have seven days to export a copy of that child’s portfolio, along with a link to activate the export. Once they've exported and downloaded a copy of the portfolio to a hard drive, the service can retain it for regulatory purposes. Once the seven days passes, all content will be deleted and will not be able to be recovered. You can find out more about exporting portfolios at Export a child’s portfolio. the email address of the parent for that child. Provided it is within the seven day period, we should be able to restore the child’s profile to your service.